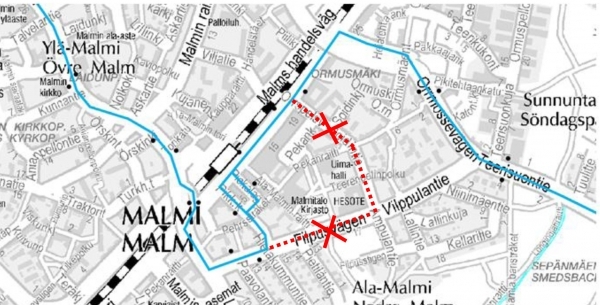 Helsinki bus route 77A will be rerouted to run in the direction of Malmi along Teerisuontie, Malminkaari, Pikkalankatu and Vilppulantie from 20 June. The new route replaces the diversion route that has been in place since April. I.e. the bus will no longer run along Soidintie. In the direction of Kalteentie, the route will not change. I.e. the bus will run along Vilppulantie and Pikkalankatu to Malmi station, from where it will continue along Malminkaari to Teerisuontie. The diversion is due to construction work on Vilppulantie and will remain in place until December.